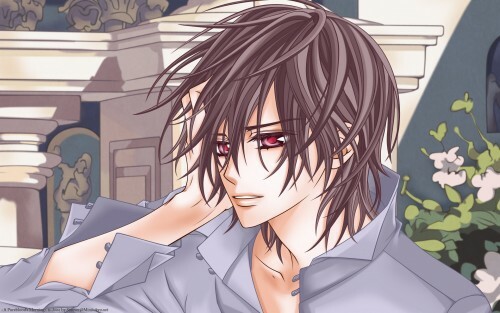 Vampire Knight Wallpaper: . :A Pureblood's Morning:. Minitokyo »	Vampire Knight Wallpapers » Vampire Knight Wallpaper: . :A Pureblood's Morning:. I decided to take a break from VK & make a nice valentine wallie for everyone here, I started searching for a perfect scan here & before I noticed it I ended up in my VK gallery folder x_x HOW? the wallpaper itself is nice.. but zero is way better.. LOL.. but i don't hate kaname..
i can't scream over kaname but he IS gorgeous in this wall XD well done ! He's gorgeous. I like a lot your lines, and you did the shading soo good. It's always a pleasure to see your works.The wallpaper looks great. this is beautiful sin chan, i love the vector, background, everything is just so awesome! fantastic job! I am SO changing my wallpaper to this~~ I could stare at it forever. ? OMG! I'm away for a couple of weeks and when I return I just open the frontpage and see the thumbnail of Kaname's wall! And by Sin-chan! Ureshii! *-* I so knew it was yours... the perfection of the vector couldn't mistaken me! Oh, Sin-chan! I'm delighted with this wallpaper. Kaname's figure is so beautiful, but so beautiful... your vector is so freaking gorgeous it's scary! The bg suits the vector and its colors perfectly. It's no disappointment to anyone! Everything's so beautiful! And I'll looking forward your next VK - Valentine's Day wallpaper! Kaname is so dashing! So beautiful! omg >< i never liked Kaname that much but woooow Sinever-san, you rockz! Somehow you made him so "not-stupid-Kaname-like" and i really like it that way! And I don't mind at all that your valentine's project will be VK! ur basicly owning the vk gallery! I actually like the soft pastelic colors alot. <33 And the vector is simply beautiful.